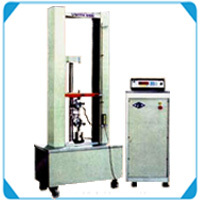 'FIE' Electromechanical Universal Testing Machines series Unitek 9400 are microprocessor based electromechanical machines with Servo drive designed for testing & studying mechanical behavior of various materials like metals, polymers, elastomers etc. These machines offer good built in features to offer excellent stand alone performance for standard tests & great flexibility for complex analysis. These machines confirm to IS, BS & ASTM standards.